Ever have one of those moments where you download photos to your Mac and then delete the originals, only to find that some didn’t copy over? Rather than curse or cry, just use Klix. Whether you’ve deleted photos, reformatted your media card, or had a card go bad, Klix recovers photos and movie files despite the vacuous state your media card appears to be in. The software works with practically any USB or FireWire camera or media reader and can recover all popular image and video formats. 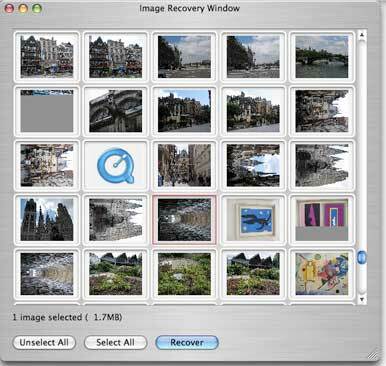 Just insert the media card into your camera or reader and connect it to your Mac, fire up Klix, click Start, and Klix begins scouring the card for lost photos and displays its findings in the Image Recovery Window. I shot a couple dozen pics on a 1GB Compact Flash card using two cameras, erased a few images on each, connected one camera to my Mac, deleted the rest of the images, and reformatted the card. I then mounted the card using a media reader to see what Klix could find. For a few minutes, I watched the progress bar creep up without a single photo appearing and got really nervous when it reached the end. But it wasn’t done yet. After another process, images began to pop up. Klix did an excellent job of recovering deleted photos from a memory card. When Klix is done, just drag and drop any thumbnail onto your desktop to rescue the file, or select what you want in the window and click Recover. I also unleashed Klix on an old SD card just to see what used to be on it, and experienced the same giddiness as I watched past memories resurface. While I didn’t have any corrupt cards to test, Klix worked amazingly well to recoup everything I thought had been eradicated.